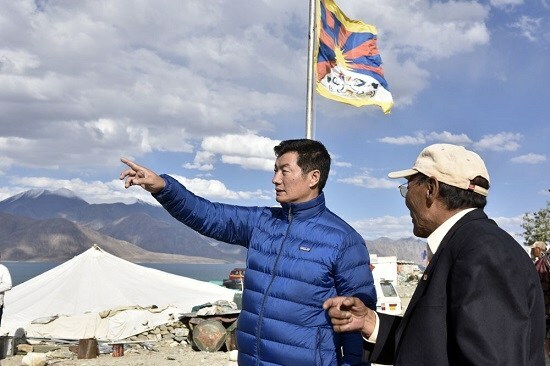 (TibetanReview.net, Jul11, 2017) – The Central Tibetan Administration (CTA) at Dharamshala, India, has issued a corrigendum Jul 10, saying its Sikyong (President) Dr Lobsang Sangay had not hoisted a Tibetan national flag on the Indian side of the Pangong Tso lake in the Ladakh region of Jammu and Kashmir state as widely reported in the Indian media and criticized by China. The lake, located at over 14,000 feet, sits astride India and Chinese ruled Tibet, with the Line of Actual Control passing through it. “Despite much media speculation I didn’t hoist the Tibetan national flag at Pangong lake. Upon my arrival at the lake, I saw the national flag unfurled at the premises of a local resident at Pangong and paid respect as you could infer from the pictures posted on CTA official sites,” a CTA statement on its Tibet.net website Jul 10 quoted the Sikyong as saying. Earlier, thewire.in reported Jul 9 that amid the ongoing stand-off in Doklam, the image of the head of the Tibetan ‘government in exile’ paying respects to the Tibetan flag on Indian territory could be seen as ‘political activity’, something Delhi has discouraged in the past. It also said Mr Sonam Norbu Dagpo, spokesperson of the CTA had earlier twice confirmed to it that this was the first time the independent Tibet flag had been unfurled by Sangay at that important location. He was further cited as saying the hoisting of the national flag had “political and personal significance” for Sangay. However, Thewire.in continued that it was later contacted by the CTA’s information secretary Ms Dhardon Sharling on Jul 9 night to say Sangay had not hoisted the flag. China reacted strongly to the report about the alleged hoisting of Tibetan flag by Sangay, with its official Global Times newspaper saying Jul 10 that India will “burn” itself if it uses the “Tibet card” to exert pressure on China amid the military standoff in the Sikkim sector.